The Betel Nut Palm is an attractive palm tree that produces nuts almost year round, the nuts NOT the leaves are chewed as a mild stimulant. This is a tree for a tropical to sub tropical garden, good green foliage and with a solitary trunk. Although to a true nut, rather a palm seed, it does have the common name of Betel Nut. The nuts or seeds appear after flowering in large bunches. Green at first and ripening to a bright orange to red. The seed is cleaned and used in a number of ways, raw, cooked and even pickled. Also known as the Supari Palm, Areca catechu or Betel Nut Palm is also used as a shade tree for Vanilla Beans. Best grown in tropical to sub tropical climates, the Betel Nut tree requires a humus rich soil, moisture and good drainage. 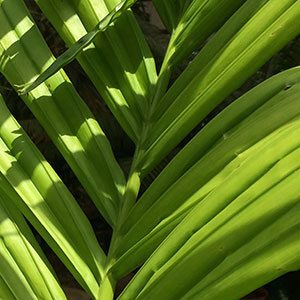 Position – Best grown in dappled shade to full sun. Shade is required in hotter climates to prevent leaf burn on younger plants. Height – To 10 metres. Watering – Keep moist during the growing season. Fertiliser – Use a good mulch mixed with some aged cow or sheep manure in mid winter to early spring. From seedling to nut production will take around 5 – 7 years. Once established up to 4 – 5 harvests can be expected each year. Propagation is from seed, seeds are planted in a seed raising mix, with the stalk end pointing upwards. Seeds need to be kept warm yet in dappled shade. Keep seeds moist yet not wet. Seedlings should be grown on in containers a=until they are 2 – 3 years old. Piper sarmentosum, which is known as the Betel Leaf Pepper and is used in asian cooking..
Piper betle, also known as Betle Leaf, this is vine, the leaves are chewed. Piper sp ‘Daka Mustard’ also known as mustard stick.